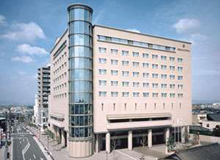 The hotel is located in Chiryu, Aichi. 3 minutes walk from Chiryu station. sales negotiations, business meetings, too. Our hotel is the regional only "Full Service Hotel" with wedding venue and banquet halls. Hotel Crown Palais Chiryu is 3 minutes walk from Chiryu station, Aichi Prefecture and located on an ideal place for business and sightseeing. We are the only hotel who has “Full Service” with wedding venue and banquet halls in our region. © 2019 Hotel Crown Palais Chiryu All rights reserved.